Fun soccer drills are important in soccer for players to enjoy the time spent in training. All work, and no fun, week after week gets repetitive. These soccer practice drills will ensure that players have fun during the training session. Players should still work hard in training, performing every soccer drill at game like pace. I always encourage players to work hard in training, so that they develop the habit of working hard in the game. From my experience as a player, and Coach, players love soccer shooting drills, playing small sided games, and working on soccer attacking drills with defenders involved. Below you will find several free soccer drills to adapt to your next fun soccer training session. Defending players will use this free soccer drill to learn how to communicate, and work with each other to close down space on the field. Attackers will start this soccer drill with bringing the ball inside the box from the opposite side. Scoring chances not as frequent, simply add another attacker, or take out another defender to allow more attacking fun soccer drill. This soccer drills should be played inside the penalty box. Soccer field not available, simply create an area about the size of the penalty box, and set up a goal at the bottom center of the grid. 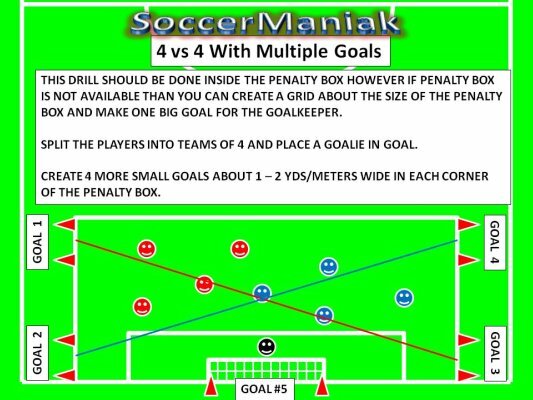 Place cones to make small 1 m/yd goals on each corner of the penalty box. 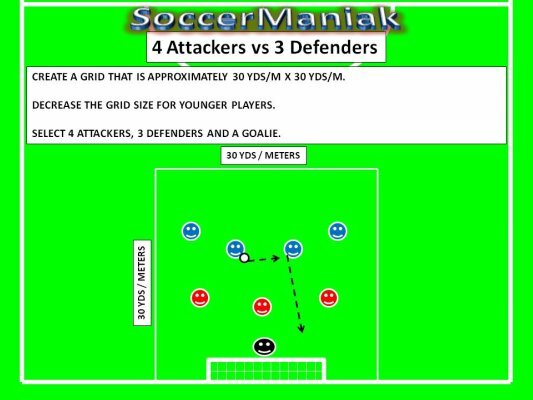 Split up players into teams of 4, and place a goalkeeper in goal. Each team will attack the big goal with the goalie, and each team will attack and defend two small goals in the corners of the grid. Players will start with playing an open game. Both teams will attempt to score on the big goal, but the only way to score on the big goal is from a cross. Whenever the goalkeeper makes a save, or the ball goes out of bounds, he/she will kick the ball to the opposite team. Limit touches on the soccer ball. Set a number of passes to complete (3 - 10), before taking a shot on any of the goals. Add a neutral player who will always play with the team in possession of the ball. The objective of this soccer drill is to teach fullbacks how to play attacking role on the field. This drill will improve the defensive players attacking tendencies through passing, overlapping and than finishing the run off with a cross. This soccer drill can be done from either side, and with 2, 3, 4, or 5 players + Goalkeeper. Start this drill half way up the field, or 40 m/yd from the goal. Adjust distance per player age, and skill level. Full back will start with the ball, controlling it with slower touches, as other players rush forward to get into a position. One of the players will get ahead on the wing, while other players try to position themselves close to the penalty box. 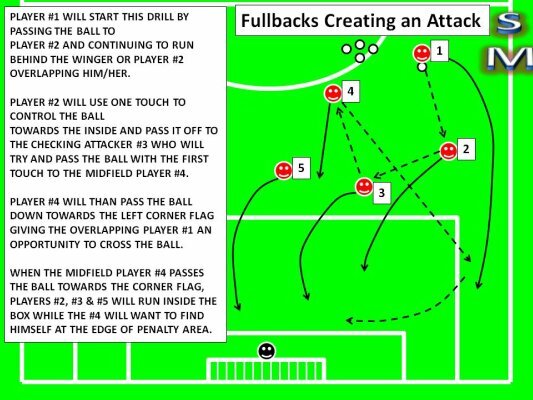 Full back will play the pass to the winger, and run behind the wingers back (overlap run), to receive the pass back and cross the ball in the box. The winger can simply take a touch inside to create space, and pass the ball towards the corner flag for full back to attack. With more players there can be more passes, bringing the soccer ball inside the field, than switching the point of attack with a pass towards the corner flag for full back to attack and cross. Adding 1 or 2 defenders inside the penalty box to defend crosses. Add rule for the full back having to cross the soccer ball on first, or second touch. Have fun and improvise. Focus on players quickly getting into the penalty box for crosses, timing their runs to avoid offside and precise one or two touch passing. Objective of this soccer practice drill is to teach players about advantages of attacking wide using crosses, and the players attacking the ball instead of waiting for it. This drill is great for the outside players because they are the only ones who can create scoring opportunities in this drill. Use half the field by bringing one goal to the half way line. Place several cones 10 - 15 m/yd away from the sideline, on both sides of the field, to create crossing channels for players. Divide players into groups of 6 players + goalie. Place 2 players from each group in the left and right channel. Goals can only be scored from crosses coming from the player inside the wide channel. Once the ball is passed wide, to the player inside the channel, this player will have to attack and dribble the defender inside the same channel, to cross the ball. Wide players will change from attacking to defending roles with every possession. When the ball is crossed, inside players will want to attack the cross from 3 important directions... near post, far post, penalty spot and one player trailing for any loose balls. Free game where the players are playing the game where the goals can come only from crosses. But instead of limiting this position to 4 players at a time, allow any player to move inside the channel and cross the ball. Add / Remove players on the inside. Add a neutral player who plays for the team in possession of the ball. Soccer Shooting Drills will help players develop their kicks on the soccer ball. There are different kinds of shooting techniques in soccer. Knowing the right way to kick the ball is crucial to firm and precise shooting. Soccer Shooting Tips to learn the proper shooting technique and positive habits for shooting the soccer ball. Fun Soccer Drills using games with attacking drills through crossing, or shooting. Soccer Passing and Receiving Drills to help players get more comfortable on the soccer ball. Players will learn to receive the ball, and move after the pass is complete. Ball Control Soccer Drills to help players get more familiar with the surface of the ball. Soccer Training Drills to improve players ball control skills. Getting familiar with the soccer ball takes time, consistency and effort. U10 Soccer Training Drills to improve ball handling skills, agility, coordination, and speed. Soccer Drills for Beginner soccer players U8 and U6. These soccer drills can also be adapted to older kids by changing the pace, and adding few skills. Small Sided Games to teach youth soccer players how to play soccer through the game being the Coach. Players will fall in love with the game from simply playing soccer. This Soccer Drill is many kids favorite soccer training drill in practice. The game is the Coach, while players enjoy competitive side of soccer in smaller spaces. First Touch Soccer Drills to help young players work on their passing, receiving, and moving. Smart players, with great ball control, will use their first touch to get out of tight situations, and surrounding defenders. Agility Ladder Drills, also called Speed Ladder Drills, are very important for soccer players to develop agility, and speed. Soccer Agility Drills are used to improve players balance, footwork, and coordination. Change of direction is frequent throughout the game, so being agile, and able to quickly change direction is really important. Soccer Conditioning Drills will build up the players endurance for the WHOLE game. Players usually frown on these soccer drills, as they push them to exhaustion point; but prepare them for the game. Fit player is twice as valuable for any team in a match. Speed Training Drills will push players to build up their explosive speed, tight cornering, and the ability to speed up, and slow down their pace. These drills will build up the players endurance, and shorten the recovery after sprints.